Canadian abstract artist Pierre Coupey’s latest show, Cutting Out the Tongue, showcases some 40 paintings spanning more than three decades. 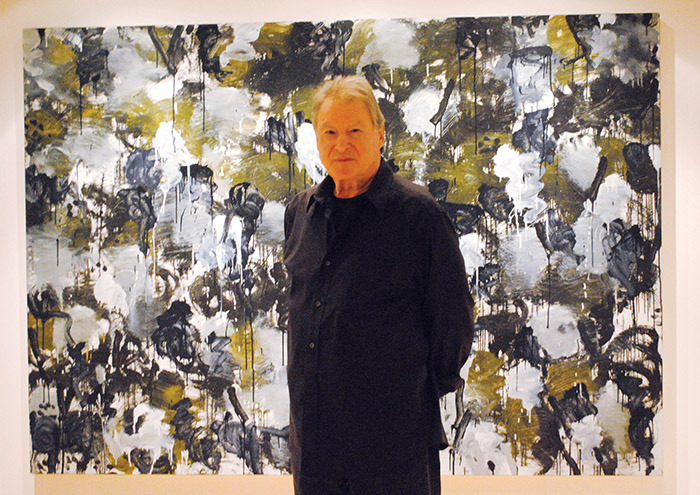 Now 70, Coupey has created other forms of art, like prints and poems, but in the mid-1970s decided to focus his efforts on painting. The title of the show is a reference to artist Henri Matisse’s famous quotation, “Whoever wishes to devote himself to painting should begin by cutting out his own tongue,” advice which Coupey plans to follow. With a background in poetry and writing, Coupey believes that his education in philosophy and literature have heavy influences in his work. Coupey often paints in sets or “clusters,” such as his collection A Book of Days, which consists of 13 paintings. “When I get bored of them or I think I’ve figured out as much as I need to… I just stop.” Many of his paintings in Cutting Out the Tongue are companions with other works of his, often with one being shown in West Vancouver and the other in Coquitlam. Coupey’s show runs from now until April 27 at the West Vancouver Museum and from March 17 to April 27 at the Art Gallery of Evergreen in Coquitlam.